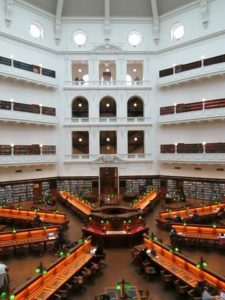 Although Sydney and Hobart were settled decades before Melbourne, the State Library of Victoria was the first free public library in Australia. It opened in 1856. 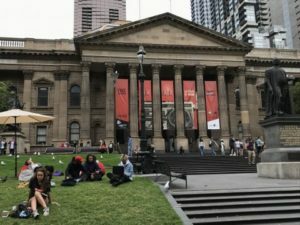 Emerge from Melbourne Central underground station, or alight from along Swanston Street tram at La Trobe Street, and you will be faced with mown lawns rising to grand Corinthian columns: the entrance to the State Library of Victoria. As you make your way up the low steps you’ll pass students sitting on the lawn, chatting, reading, eating their lunch, while on the paved area in front of the library’s portico people earnestly move chess pieces on two chessboards. Inside, one of the Library’s many reading rooms is devoted to chess called, naturally, the Chess Reading Room. 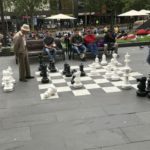 As well as a range of books and materials of interest to chess lovers, boards and chess sets are available for more intimate games than the public one outside. The most geometrically beautiful room is – for me – the Domed Reading Room, now known as the La Trobe Reading Room. Its floor is a star of reading desks, while its octagonal walls beneath the great dome through which light streams are lined with books. Besides the many specific reading rooms, there is the Cowan Gallery that exhibits some of the Library’s rich collection of paintings depicting Victoria’s history and people. The south side of the Library is the Wheeler Centre for books, writing and ideas, named after Tony and Maureen Wheeler of the Lonely Planet travel books who made a substantial donation. Beneath the Centre and the Library itself is The Moat, a warm and inviting restaurant frequented by many writers and book lovers. Charles La Trobe was the first Lieutenant Governor of Victoria. He took up office when Melbourne was a fledgling city of some 3000 people and had the initiative, with Justice Redmond Barry QC, to establish a free Library. We have much to thank him for. Another great post, Diana. I love this library! So do I, Elise. Don’t you find it’s a great place to take visitors to Melbourne? One of my favourite places in Melbourne, Diana and lovely to read some of the history. Once again, an excellent blog post about a special place. One of mine, too, Corinne.